I’ve got the most delicious lunch for you today! 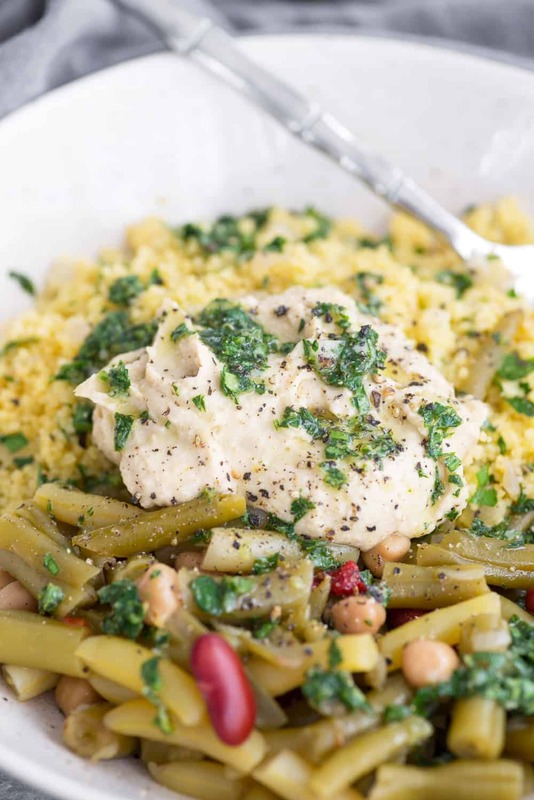 A bean salad bowl filled with all of the good stuff: herby couscous, creamy hummus, the most incredible lemon-parsley dressing and tangy READ 4 bean salad. YUM. The inspiration for this came from a meal that I had a few months ago when I was in NY. I needed to grab a meal quickly before heading to the airport and stumbled upon this cute little deli with rows and rows of prepared meals and salads. I love these kind of places and wish more of them existed in St. Louis! I grabbed a bowl of things that sounded delicious: couscous, hummus, different kinds of beans, roasted red peppers and a dressing packed with a few different kinds of herbs. Wow! So incredibly delicious. I ate that salad in the cab on the way back home and knew that this one was going to be recreated at some point in the future. Doesn’t this salad look so incredibly fresh? It’s perfect for this time of year when breakfast is sometimes leftover Christmas cookies and dinner is cheese, heavy apps and wine. At least that’s how it feels for me. I love December but also need a clean meal break sometimes from all of the celebrations. This is the perfect lunch for those kind of days. It also couldn’t be simpler to put together. 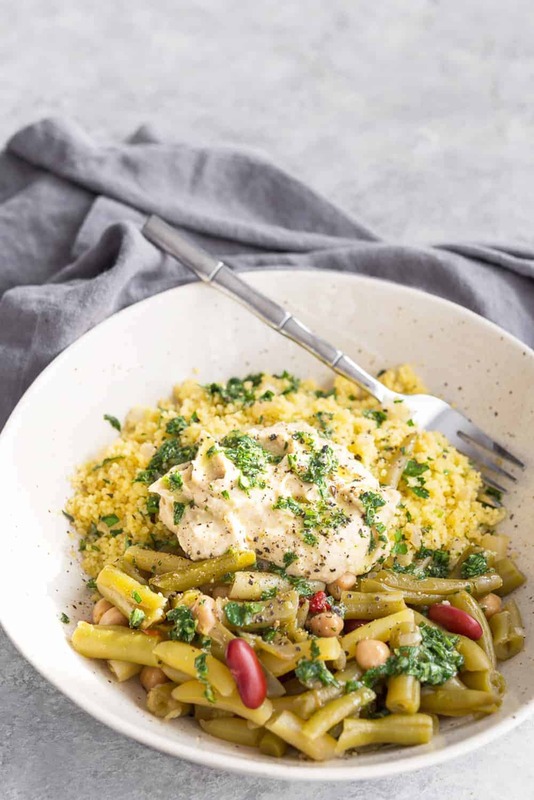 The couscous takes 10 minutes to prep, the hummus is already done and the dressing is just a handful of ingredients and so delicious, you might not buy prepared dressing again. The 4 bean salad is made with green, wax, kidney and garbanzo beans. Gluten-free, fat-free in a tangy-sweet vinegar based dressing. It pairs perfectly with the ingredients here and makes for an effortless, healthy lunch or dinner. 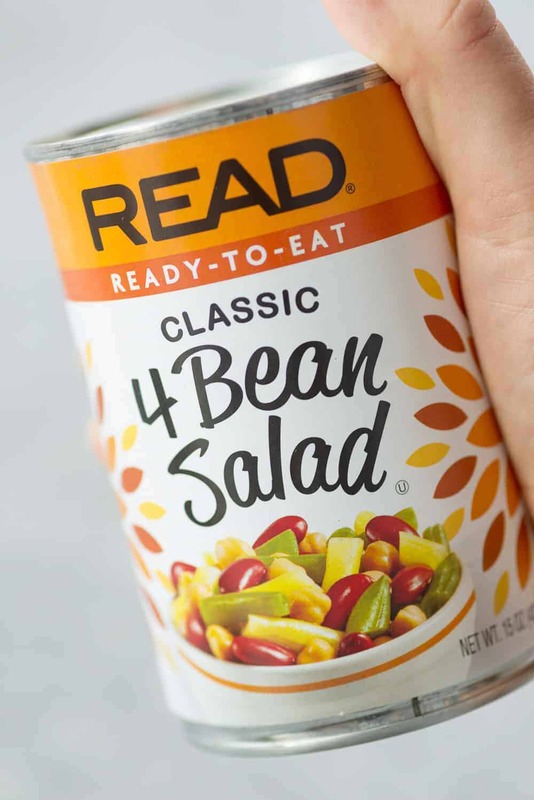 Look for READ Salads in your grocer’s canned vegetable aisle. AND, as a thank you for being a DK reader, I’m giving away a READ Family pack with ALL of the READ products + a $50 gift card. Enter below in the comments. I’ll pick a winner next week! 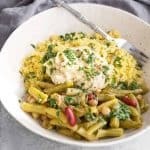 Lebanese bean salad bowls! Herb couscous with hummus, lemon parsley dressing and 4-bean salad. Vegan, plant-based and ready in less than 20 minutes. Make the couscous. Heat a medium saucepan over medium heat and add oil to the pan. Add shallots and saute 2-3 minutes until shallots are just tender. Add in the couscous and saute for another minute until couscous is lightly toasted. Add the broth and salt, then bring to a boil. Cover with lid and remove from heat and let stand 5 minutes. Fluff with a fork, then stir in the parsley. Make the dressing. Whisk together the parsley, lemon juice/zest, garlic, salt, pepper and mustard together in a small bowl until mustard is dissolved. Keep whisking the ingredients together and slowly drizzle in the olive oil until a dressing forms. Season to taste, adding more salt and pepper as needed. Add 2 tablespoons of the dressing to the couscous and stir in. Make the bowls! 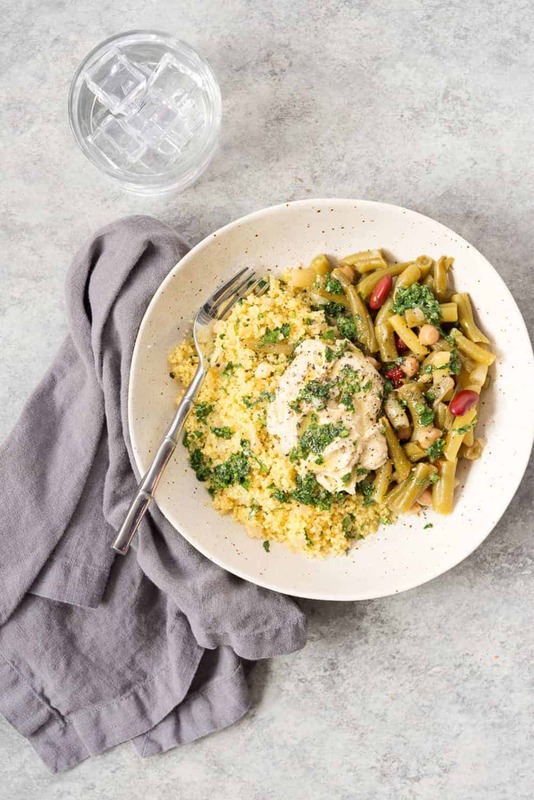 Divide the couscous into 4 bowls and top each bowl with bean salad and hummus. Drizzle with remaining dressing and enjoy! I was unfamiliar with this brand, but when I checked the store locator I was surprised to find a couple of stores in my are a that sell it. I’ll check it out next time I’m there. That looks so yummy! I have never heard of READ before, but I’ll have to be on the lookout. This sounds really yummy, I might make this for a potluck I have coming up! Alex, this sounds just what is needed in this season of celebration. I’ll have to look for Read products on my grocery shelves. Thanks for a great simple meal! 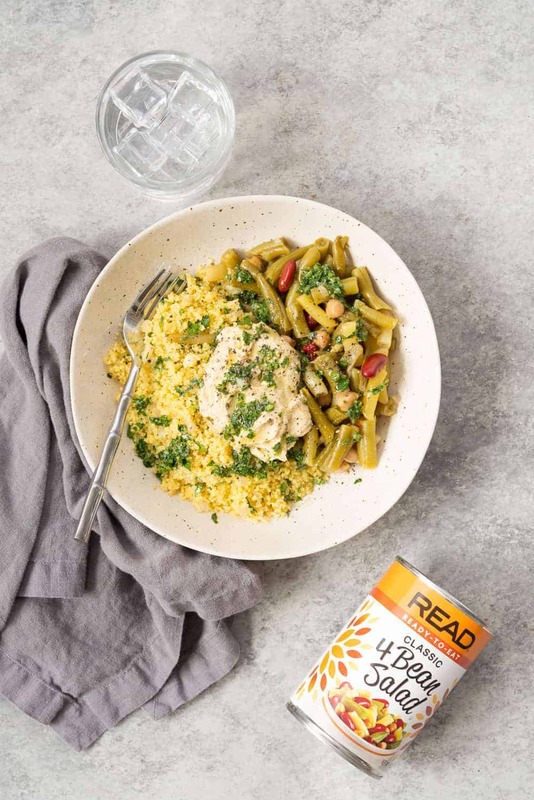 This recipe looks delicious and I’d love to win Read products! I had never heard of this brand, but I looked through their selection, and then used the store locator, and saw that every single grocery store in my area sells their products. Those salad cups they make would be great for the lunchbox, not just for me, but for my kids as well. This does look delicious. We’ve been eating vegetarian now for years, and bean salads are a fav. I love this pairing with couscous! Beans are so healthy and versatile! I appreciate that your recipe is vegan. This looks really good and easy too. I’m looking forward to trying it! Just wanted to add that I made this, and it was really delicious. My daughter & I both loved it. Thanks! Awesome! Thanks Parie! Glad you liked it! Looks delicious. This is a new brand to me. Will definitely keep my eye out for it. Looks like I’ll be trying this out soon! This looks so tasty! Definitely trying soon! Delicious and convenient. Thank you for sharing! This looks delicious and good for you. I am always looking for vegetarian recipes for my son. I’m gonna try this. It’s good that there are some good vegetarian recipes out there. This looks so delicious! Thanks for introducing us to great brands! Love the giveaway and post. Thanks for the chance. Their products look so delicious and a great addition to a healthy meal. I love hummus and this salad looks delicious! The food looks so yummy and we’d love to win READ’s products. I’ve never seen that combo in a can but what a great shortcut! Will definitely have to look for this in stores! Oh how fun! I’ll have to look for this st the store this weekend! What a great way to add variety to the diet, especially when cooking for one! I have not heard of this brand either but this looks like it would make a great lunch salad. I love beans and I’d love to try this brand! I have never heard about these products, but not surprised since I just looked at where they can be found near me and the two places (Walmart & King Kullen) are stores I don’t shop at. However, I will now make a point to go to either store to look for the German Potato Salad, that is something I think I’d really enjoy. Good to learn about products I haven’t heard. Thank you for the recipe. It does look delicious and fresh. It seems like a great balance for the heavy food of the season. This looks good I have not seen that kind of beans in a can but I will be sure to watch for them. Looks like a great combination to go with many dishes. This bean salad recipe looks so good, especially the dressing! Yummm! I should incorporate beans more frequently, and this recipe would be a great one for me to try! I’d also love to try READ products!